October was the worst month for stocks since 2009, but DHX bucked the trend and posted big gains. 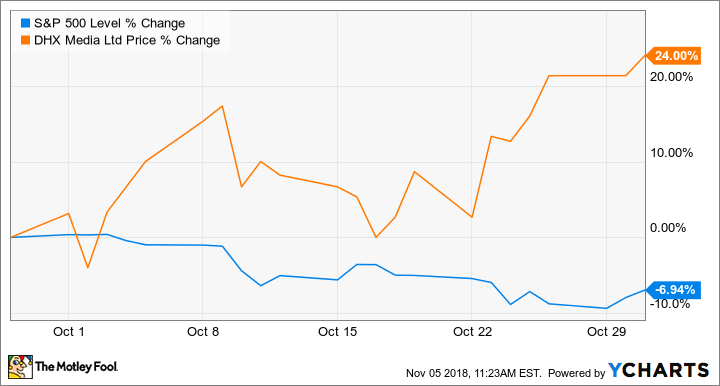 Shares of DHX Media Ltd. (NASDAQ:DHXM) climbed 24% in October, according to data provided by S&P Global Market Intelligence. In a month that saw the major U.S. indexes post their biggest slides since February 2009, the Canada-based children's entertainment company's share price rebounded from steep September sell-offs. DHX Media fell roughly 19% in September on fourth-quarter results that were weaker than the market anticipated but bounced back after management outlined some new initiatives and made new licensing deals. The company revealed on Oct. 3 that it had licensed Spanish-language versions of 10 shows for Amazon's Prime streaming service. DHX Media published an earnings preview on Sept. 13, ahead of its fourth-quarter release on Sept. 24, outlining expected performance that came in well below the market's expectations. Shares plummeted 41% in the day of trading that followed the preliminary report but rebounded following the actual quarterly report, as the company, in its conference call, laid out its plans to continue refocusing the business to better take advantage of digital distribution. DHX plans to focus more on producing content for streaming platforms and get more out of established brands like Peanuts and Strawberry Shortcake. The company has managed to increase its trailing revenue roughly 130% over the last five years, but investment in new productions and underperforming content have led to sinking net income, so some manner of pivot appears to be needed. 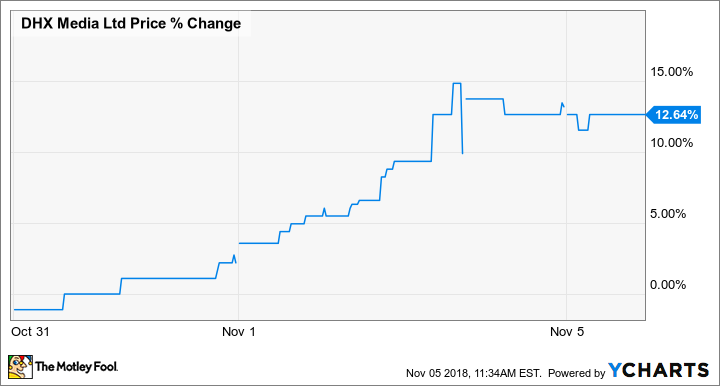 DHX stock's rally has continued into November, with shares advancing roughly 12.6% in the month so far. DHXM Price data by YCharts. However, even with the recent gains, the company's stock is down roughly 40% year to date and is valued at just 0.8 times expected sales -- a metric that suggests the company could still be a value play. DHX Media has a deep catalog of children's entertainment properties and an assortment of reliable development studios -- assets that could help the company bounce back or attract buyers in the content-hungry streaming market.